With so many music applications out there, it is really hard to find the perfect one and none of them seems to satisfy a user completely for some reason. If it goes to give you all those high-end features, the lower end is completely ignored and let’s face it, no one even bothers downloading anything that focuses on the low-end. Google has done a real good job with the overall aesthetics of pretty much every application they launch onto the Google Play Store for users to play with. Now Playing, while still in the developing phase, has loads to offer and it follows similar aesthetics as Google so it’s also clean and pleasing to the eye. By the time you install and open the application, it will automatically have synced all your music for you and instantly take you to the ‘Artist’ tab. You can use finger gestures (left to right and vice versa) and scroll between Albums, Songs, Genres, Recent, Playlists, and Search. You will see a very clean interface, and the usage is very responsive and smooth with absolutely no flaw whatsoever. You will see nice little stack of controls on the lower right allowing you to skip forward, backward and play/pause. Once you hit a song to play, you will notice the song name at the lower right. You click and you will be transported to a different screen where you will see a downloaded album art if of course you don’t already have it installed. From there, if you swipe left, you will be taken to a screen with the lyrics to the song currently playing while swiping to your right will take you to the song list. You can go back to the main screen by pressing Now Playing at the top right. You have the option to put on a sleep timer whereby the songs will stop playing after a set time and you can shuffle the songs too if you will. All the standard settings are available, including a toggle for allowing lyrics and album arts to be downloaded via WiFi only. You can also allow transparent widgets and lockscreen controls, both to be activated in the settings panel. 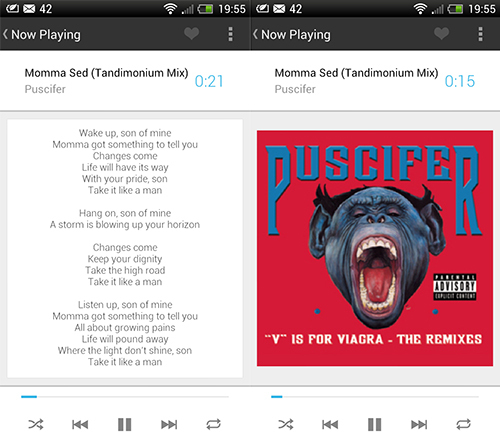 Overall, this is a very neat job with a music player. It is easy to use, looks quite elegant and works flawlessly and considering it is still in the Beta phase means that it will definitely go a long way. You can download it here and let us know what you think in the comments.